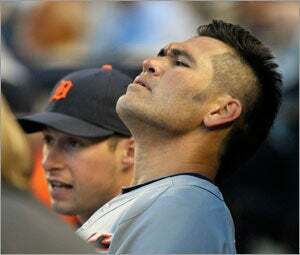 Johnny Damon is thinking over whether he wants to return to Boston. He has until Wednesday afternoon to decide. 1. The Tigers pull him back. 2. The Tigers make a trade with the Red Sox. 3. The Tigers let him go for nothing, leaving the Red Sox on the hook for roughly $1.8 million. Photos: Johnny Damon through the years. Damon’s contract has a clause requiring him to approve a trade to all but eight teams on a list. The Yankees and Rays are on that list, the Red Sox are not. So Damon could seek financial incentive to approve the deal. “It’s probably as tough of a decision for me to make right now as it was for me to leave Boston for New York. It’s something that, fortunately, we have some time to think about,” he said. “At this moment, I’m not sure I want to leave Detroit for that. I enjoy playing here. I enjoy the kids I’m playing for, the coaching staff. But obviously, Terry Francona is amazing. But it’s something that I’m going to have think long and hard over. As for playing in Boston again, Damon has mixed feelings. Damon said the booing and cursing he received from Red Sox fans while he played in the Yankees “absolutely” bothered him. “If I do this, and we pulled everything together and I could help them get into the postseason, it would change everything again,” he said. Damon is hitting .270 with 30 doubles, seven home runs and 40 RBIs. But he has played only 36 games in the outfield this season and is hitting .219 in August (16 of 78) with eight RBIs and 20 strikeouts. Jason Varitek is all for the idea of Damon returning to Boston. “He’s a special player. He’s pushing Hall of Fame-type numbers. And you add that Johnny’s great in the clubhouse, he’s a gamer on the field and one hell of a teammate,” said the Red Sox captain, who called Damon one of his favorite teammates.